Prime Minister Narendra Modi on Sunday condoled the deaths that occurred due to a landslide in Himachal Pradesh's Mandi district. A team of NDRF is going to Mandi to take part in rescue and relief operations and provide all possible assistance required, the PMO said. A number of people died after a massive landslide hit two buses of Himachal roadways on the Mandi-Pathankot National Highway. "Pained by the loss of lives due to landslide related accidents in HP's Mandi district. My condolences to the families of the deceased," Modi tweeted. "I pray for the quick recovery of those injured in Mandi district, Himachal Pradesh," he added. 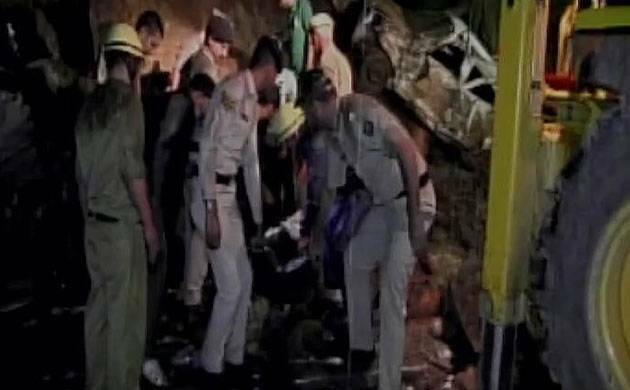 Two Himachal roadway buses were hit by a massive landslide triggered by a cloudburst on the Mandi-Pathankot National Highway last night, leaving 46 passengers dead while the fate of 20 others was not immediately known. Earlier in the day, seven people were reported killed after three vehicles hit by a landslide at the same road near Padhar in Himachal Pradesh's Mandi. Immediate rescue operations were launched. #UPDATE: Himachal Pradesh's Mandi landslide: Mandi Deputy Commissioner Sandeep Kadam says 46 bodies recovered so far, rescue ops underway.